If you haven’t got a website you are losing out on potential customers. Our starter websites make it easy and affordable for every business, no matter how small, to get online and get noticed. Take action now and your website will be online within a few days attracting new customers. 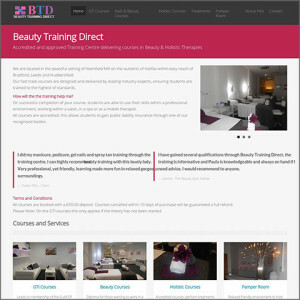 Although we have been developing customised websites for years, we also offer starter websites which we develop using our library of pre-developed templates which allows us to produce professional looking websites at such low prices that every business (or club, organisation, etc), no matter how small, can afford one. Despite the low cost these sites are fully responsive (mobile friendly), great looking and still include full search engine optimisation. We have a good choice of designs and colours and will match an appropriate design and colour to your requirements and modify it accordingly. It is up to the client the provide us with text and images. The exact cost of a starter website varies depending on the clients requirements but a typical starter website costs around £200 (plus annual hosting/support costs), a small price to pay for more customers and a professional image. We will always give a firm quote after discussing requirements. We recently introduced our Traksite fixed price websites for the unbelievable low cost of £99 (plus £11.99 per month) to give the lowest cost option possible. These are of similar quality to our Starter sites but slightly simpler and you must order online and provide us with exact text, images and SEO search terms for the site. We’ll still contact you to discuss the design and colours but basically there’ll be less flexibility than with the normal starter website. Visit Traksite for more information and to order your fixed price website. For more information on starter and fixed price websites please contact us. Although we are based Brighouse, West Yorkshire we offer our services to the whole of the UK. Here is just small selection of places where we have or have had clients: Brighouse, Huddersfield, Mirfield, Halifax, Holmfirth, Marsden, Meltham, Elland, Sowerby Bridge, Bradford, Leeds, Dewsbury, Wakefield, Barnsley, Sheffield, Dronfield, Manchester, Nottingham, London.